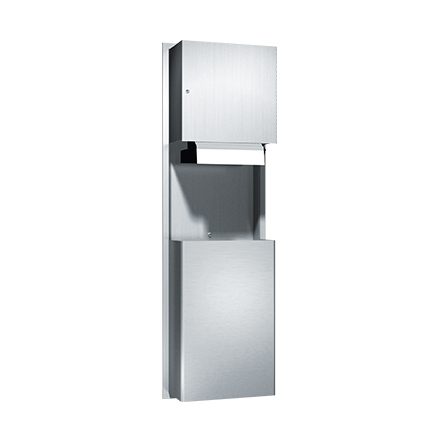 Automatic Roll Paper Towel Dispenser & Waste Receptacle, 110-240V / AC – Recessed, 12 gal. Proximity sensing no-touch recessed unit dispenses a pre-set length per cycle from 8″ or 9″ (205 or 230 mm) wide, 800 ft. (244 mm) long rolls. 12 gal. (45.4 L) waste receptacle. Powered by C-UL-US and CE approved internal low-voltage adapter (supplied) using 110-120VAC, 50/60 Hz and providing output of 5VDC @ 1A and operates automatically to activate towel dispensing when hands are placed in sensor zone.